Russian black cod, gently seared on a teppan, basted with buttered macadamia crush, garnished with white radish and served with steamed spinach. Japanese cuisine unlike any you’ve had before is sophisticatedly served riverside by the unique and creative Kobe Jones Melbourne. Diners arrive in droves for the simplicity of the Kobe Jones experience – located at WTC Wharf right on the Yarra with easy access by road, foot or water – which allows the eastern and western flavoured nuances within the food to define the top quality experience by taste. 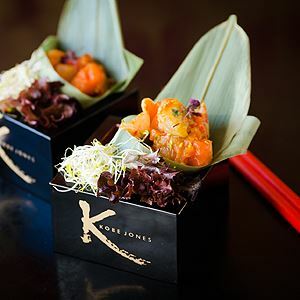 Divided into a variety of sections, including small plates, sashimi, teppanyaki, salads and signature dishes, Kobe Jones’ extensive food selection is designed for sharing, with a range of pre-suggested menus for those struggling to decide. Pass around plates like seared green tea salmon and watercress salad; or Wagyu tataki, seared and chilled, served rare with garlic, ginger and ponzu sauce. 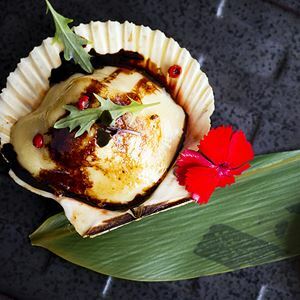 Kobe Jones's food is designed to bring the simplicity and beauty of Japanese cooking and meld it with nuances and surprising flavours of the west. Our chefs have created an array of flavours to suit every palate–for the first timer to the most adventurous diner. flavours in our dishes. This combination led us to the name Kobe Jones. and feedback, because you are the reason we exist! Our menu is in sections–small plates, large plates, signature dishes, rolls, tempura, hot rocks, sushi and sashimi and dessert. At Kobe Jones we believe in ‘graze dining', which means our dishes are served share style with dishes designed to be shared by three people. We think the best way to dine is to choose from each section of the menu at two dishes per person. Of course, seasoned Kobe Jones patrons will have their favourites but don't forget to explore with your taste buds. Because our menu is so extensive, we have designed some suggested menus to make it easier for you and give you a balance of flavours and textures. If there are just two of you, we have a special Perfect for Two menu which lets you savour our complete range of flavours. Kobe Jones Melbourne provides a perfect location, and great food riverside to offer to any evnt a unique experience. As all our food is prepared on our teppanyaki table in front of the guest, an event at Kobe Jones will be interactive full of inspiration and interest, and will be as we like to say Japanese like you have never had it before. With a vairety of sit down or stand up options as well as the wharf side location and boat access we can ensure an event to remember. Very nice indeed, had heard about it and actually eaten when it was at Docklands food still as good and love the location. Got a coupon online, if not usually wouldn't go for a place like this. Amazing food, deceptive with amount of food it fills you up. A dining experience not to be missed. Menu selection is exceptional with an artistic presentation of meals that definitely will draw you back again. Great locations in Sydney and Melbourne, complementing outstanding food, drinks and service, make Kobe Jones Restaurants an exceptional choice for your next function. For more information, call (03) 9329 9173.